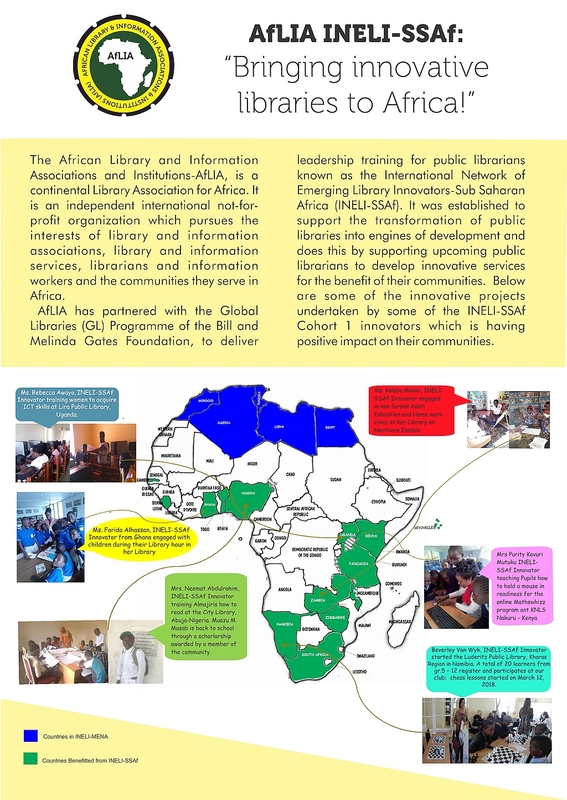 MBAMBO-THATA, Buhle and APPIAH, Doreen (2018) INELI-SSAf – “Bringing innovative libraries to Africa!“. Paper presented at: IFLA WLIC 2018 – Kuala Lumpur, Malaysia – Transform Libraries, Transform Societies in Session 153 - Poster Session. 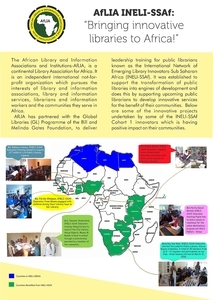 This poster outlines the impact of the International Network of Emerging Library Innovators Sub-Saharan Africa (INELI-SSAf) on libraries in Africa. INELI SSAf is a training program for Public Librarians that equips them to lead innovative library services. It has 32 innovators and eight (8) Mentors from fourteen (14) countries. The INELI-SSAf program contributes to transforming Public Libraries into engines of development, Bringing Innovative Libraries to Africa! The poster will demonstrate success stories of impact. It will highlight that participants of the programme, deliver services that impact communities thru information for farmers, children’s reading programmes, women’s information and digital literacy among others. It will further show that through INELI SSAf, AfLIA is ensuring libraries are transforming communities in Africa. The poster will further demonstrate alignment with the development agenda. Highlighting that INELI SSAf is building capacities of Public Librarians to deliver programmes that support education and public access to information in accordance with UNSDGs, AU 2063 and the national development agenda. The poster will be printed. It will include photographs of sites, and innovators at work in their libraries. The examples will come from participating libraries and librarians.